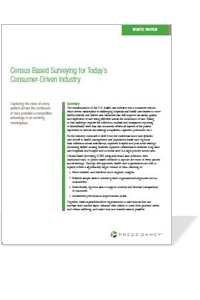 To illustrate how your organization can gain a competitive advantage through robust data collection, Press Ganey has developed a new white paper, Census Based Surveying for Today's Consumer-Driven Industry. The paper provides a framework that leverages electronic communication to amass significantly more patient experience data across care settings to help providers improve performance, increase loyalty and grow market share. Collect a larger volume of statistically valid data in a shorter amount of time. Derive more detailed, targeted insights. Commit to internal and external performance transparency. Research and case studies presented in this paper detail best practices to enhance your ability to meet patients' needs, reduce suffering and advance the delivery of patient-centered care. For more information, contact insights@pressganey.com. Complete the form to receive your copy of the report. Insights in this paper demonstrate how utilizing CBS enables organizations to gain a competitive advantage through robust data collection.